Ozeri Extravo Electric Wine Opener in Stainless Steel with Auto Activation is awesome. I never seem to have a wine bottle opener around. I also hate struggling with a regular wine opener trying to get my wine open. That is where the Ozeri Extravo Electric Wine Opener is so helpful! First, you ue the included foil cutter to remove the wine bottle seal. Then gently push down on the wind bottle to activate the auto cork removal. Last, release the pressure and the cork is automatically ejected from the opener. Yes, it is that easy. The Extravo’s built-in rechargeable battery opens up to 60 wine bottles on a single charge. The Ozeri Extravo Electric Wine Opener is completely cordless and includes compact foil cutter that doubles as a stand. It also ships with a bonus wine pourer and stopper. The Ozeri Extravo Electric Wine Opener with Auto Activation opens both natural and synthetic corks. This is a must get for all wine drinkers! To keep the decorative edges of a piecrust from browning too fast, cover the edge with foil when the crust begins to brown. This is an easy to make recipe. However, it does need a couple of tweaks. This was the first time for us to make this recipe, and I would definitely not add as much beef broth. It was super good, but very soupy. 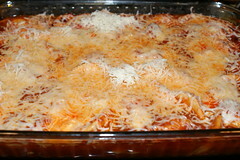 Besides that, this is an excellent recipe that I got from the Kraft Foods website. Preheat over to 375 degrees. Combine spaghetti sauce, tomatoes, broth, and dressing in a 13x9 backing dish. Add ravioli and toss to coat. Cover with foil. 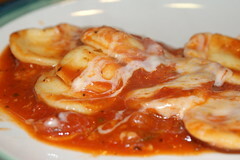 Bake 50 minutes or until ravioli is tender. Remove foil and stir. Sprinkle with cheese and let stand 5 minutes or until cheese is melted.